The Standard Motor Company was established in Coventry by Reginald Maudslay. The Company's Canley site opened in 1916 for wartime aircraft production, and by the 1930s was the Company's principal plant. Captain John Black joined the Company from Hillmans in 1929 and oversaw a reorganisation of the company. After 1945, the company acquired the Triumph Motor Company, whose Coventry premises had been destroyed by bombing. 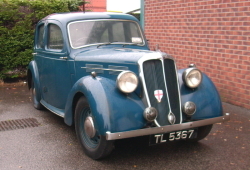 The Standard Vanguard range replaced the pre-war models in 1948, and the Triumph name gradually became dominant. The semi streamlined 'Flying' models (so called because of their fastback styling) were launched at the 1935 Motor Show in 9, 10, 12 & 14 hp versions. The 12 hp model features a 1608 cc side valve 4 cylinder engine with 4 speed synchromesh gearbox and cable brakes, and was priced new at £ 259. This car was presented to the Society by Miss Sybil Ingoldsby on her retirement as secretary to Mr Raymond Mays of Bourne, a founder of the E R A racing car dynasty which subsequently became known as B R M.
Update - September 2012 - A vehicle restoration fund for the 'Standard' has been launched. The car has been on display in our Museum since it was donated, but has never been in a roadworthy state. Donations are being sought to return the car to running order so that it can attend events and give rides at our 'Open Day' events. Cheques should be made payable to "LVVS Ltd"
Alternatively, donations may be made online with a credit card or Paypal account, or when visiting the Museum.